All Department positions in Iraq (with the exception of the Ambassador and the DCM) are 1-year tours of duty and are unaccompanied. The Department has not permitted family members, with the exception of those spouses who qualified for approved eligible family member (EFM) jobs at the Embassy. Shared housing is cramped and privacy minimal. Recreational opportunities are limited. The work tempo is intense; in part because the embassy is in a war zone. On July 28, 2009, the following nominations were reported out of committee by Senator Kerry of the Committee on Foreign Relations. These nominees are mostly for African posts (non-controversial and all that), so I expect that majority of these would get confirmation before the Senate breaks on August 7 for the summer. Thomas A. Shannon, Jr., resigned. America to the Federative Republic of Brazil. America to the Republic of Maldives. America to the United Republic of Tanzania. America to the Kingdom of Morocco. America to the Kingdom of Saudi Arabia. America to the Kingdom of the Netherlands. America to the Republic of South Africa. July 20, 2009. Transcript of the interview is here. Consular Section of the U.S.Embassy in Mexico City. The OIG has released its recent inspection report on US Mission Mexico. Initially marked “SBU” or Sensitive But Unclassified, the OIG reports are normally posted online not too long after their official release. Some of these reports are redacted and there are classified portions that the public do not get to see but they usually give a fuller look on the operation of every section in an embassy within a specific time frame. These reports identify systemic problems such as lack of resources and normally gives a rundown on internal challenges like morale and staffing, and external factors such as local challenges and policy impact. OIG inspections make some bad managers jittery; but methinks this is an excellent tool for great managers constantly looking at improving their operations. Why? Well, for one thing, State is not known for having a risk-averse culture for nothing; really. Not very many people are going to march into the Front Office and tell their ambassador here is what’s wrong 1,2,3. Second, it’s lonely at the top (this is not necessarily unique to the Foreign Service). Once you’re in the Front Office (or in the executive suite), people tend to tell you things that they think you want to hear. But what they won’t tell the boss, they might tell the OIG inspectors. This inspection took place in Washington, DC, between August 4 and October 3, 2008; in Mexico City between October 6 and November 25, 2008. Bush appointee from Texas, Antonio O. Garza, Jr., was the US Ambassador to Mexico from 2002-2009. His number 2, was career diplomat, Leslie A. Bassett who is currently the DCM at US Embassy Manila and was the Deputy Chief of Mission in Mexico when this inspection was conducted. Mission Mexico, consisting of an embassy, seven consulates general, two consulates, and 14 consular agencies, is one of the largest U.S. missions in the world. The magnitude of the consular operation is staggering: 20 percent of all arrests of Americans abroad occur in a single consular district in Tijuana. 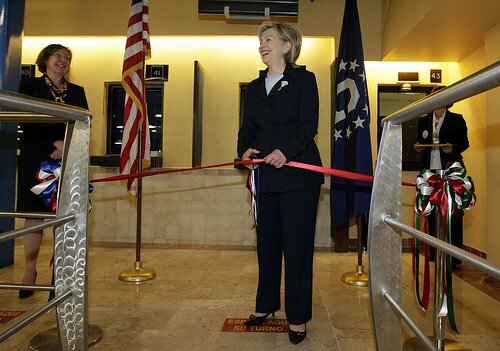 Consulate General Ciudad Juarez processes more IVs than any other post in the world. Embassy Mexico City processes more NIVs than any other post in the world except Embassy Seoul. Because of the consular workload, 10 percent of all entry-level officers (ELO) in the U.S. Foreign Service are assigned to Mexican posts. With such numbers, Mexican experience will have an important influence on the next generation of Foreign Service officers. The OIG team found that Mission Mexico is well run, with strong leadership from the Ambassador and DCM. Morale is generally good. The Ambassador and the DCM promote entry-level professional development. Interagency coordination and cooperation is outstanding. Mission Mexico is a success in representing and advancing the interests of the United States in a key country. The mission is, however, significantly understaffed and underfunded. The consular workload per individual officer already exceeds worldwide norms. For example, in Consulate General Ciudad Juarez, each officer must process almost twice as many IVs as the other large IV processing posts elsewhere in the world. The NIV workload for the mission will dramatically increase in the next few years as the mission is expected to receive more than five million applications for renewal of border crossing cards. The Western Hemisphere Travel Initiative will require uncounted numbers of American citizens resident in Mexico to acquire passports for the first time. The violence associated with narcotics traffickers has dramatically increased the workload of the mission’s security officers, and introduces uncertainty in projecting the workload of most mission operations. Implementation of President Bush’s and President Calderon’s Merida Initiative against narcotics traffickers will increase the staffing levels in Mexico City by more than 50. Up to now, Staffing in the management section has failed to keep pace with even the modest growth in consular and other staffing. It is altogether inadequate to support the projected large increases in consular and Merida Initiative staffing. Resource shortages will result in officer burnout and the breakdown of internal controls. Unless addressed, the shortage of resources will jeopardize Mission Mexico’s current success in meeting its goals. The WH released the following brief bio: Currently a Vice President for International Business Development with RTI International, Aaron Williams has over 25 years of experience in the design and implementation of worldwide assistance programs. As a senior manager at the U.S. Agency for International Development (USAID), where he attained the rank of Career Minister in the US Senior Foreign Service, and as Executive Vice President at the International Youth Foundation, Mr. Williams established innovative public-private partnerships around the world. As USAID Mission Director in South Africa, Mr. Williams led a billion dollar foreign assistance program during President Nelson Mandela’s administration. In addition to his work in South Africa, he has extensive experience in the strategic design and management of assistance programs in Latin America, Africa, Asia and the Middle East; including long-term assignments in Honduras, Haiti, Costa Rica, and Barbados and the Eastern Caribbean islands region. In addition to his tenure with USAID, Mr. Williams served on the Advisory Committee on Voluntary Foreign Aid at USAID. Mr. Williams was awarded the USAID Distinguished Career Service Award and the Presidential Award for Distinguished Service twice. He is a member of the Council on Foreign Relations, and he serves on the Advisory Board of the Ron Brown Scholar Program, the Board of Directors of CARE, and the Board of Directors of the National Peace Corps Association. Mr. Williams served as a Peace Corps Volunteer in the Dominican Republic (1967-70). Upon completing his service, he became the Coordinator of Minority Recruitment and Project Evaluation Officer for the Peace Corps in Chicago (1970-71). Mr. Williams is fluent in Spanish. He is a graduate of Chicago State University, and has an MBA from the University of Wisconsin. Click here to see the confirmation hearing statements and videos. You remember that US Ambassador to Indonesia Cameron Hume dived into a shark tank to celebrate Earth Day a few months back? The Embassy has also sponsored the “Ocean in Focus” competition. To celebrate our country’s 233rd birthday, it offered a special quiz about America, exclusively for its Facebook fans. It has also partnered with Smart FM producing “Smart Up Your Life,” a one-hour English language learning program aimed at young professionals who want to improve their English skills. The show featured music, a sharing session with local public figures (managers, employees, lecturers and others) as well as an interactive (call-in) session with listeners. Now in time for President Obama’s 48th birthday, the embassy is running a competition for its Facebook fans creatively greeting the President on his birthday. Below is a quick rundown of the competition. Snap a photo showing you creatively wishing President Obama a “happy birthday” in time for his 48th birthday on August 4th. Update your profile picture to that photo and add a caption. 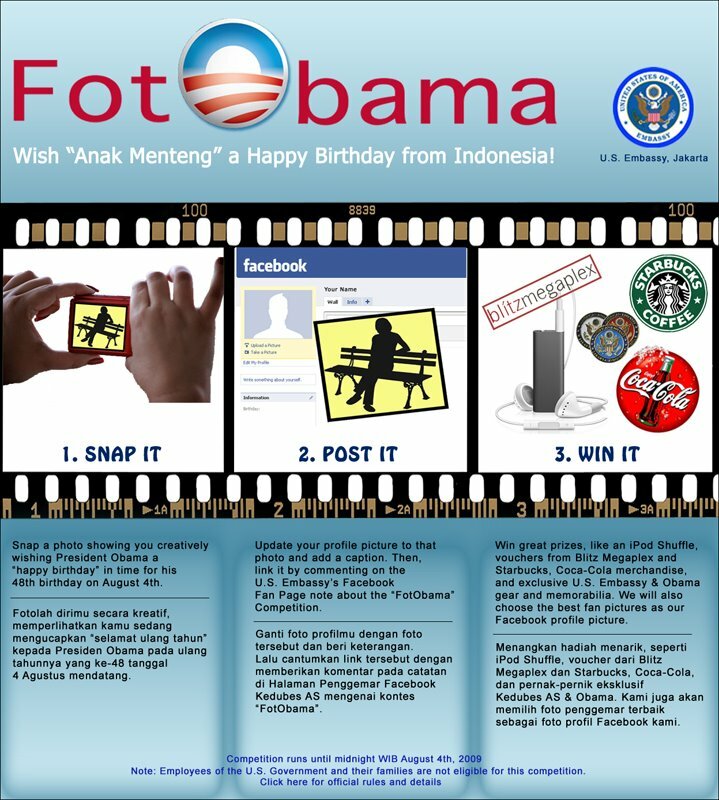 Then, link it by commenting on the U.S. Embassy’s Facebook Fan Page note about the “FotObama” Competition. Win great prizes, like an iPod Shuffle, vouchers from Blitz Megaplex and Starbucks, Coca-Cola merchandise, and exclusive U.S. Embassy & Obama gear and memorabilia. We will also choose the best fan pictures as our Facebook profile picture. This competition is presented by U.S. Embassy Jakarta, supported by Blitz Megaplex, Starbucks, and Coca-Cola. This competition is exclusively for U.S. Embassy Jakarta Facebook Fans. Employees if the U.S. Government and their families are not eligible for this competition. 1. Photo should be posted to your Facebook account and set it as your profile picture. 2. Add a caption to the photo. 3. Photo should be the participant’s own work and free of any copyright other that his/her own personal copyright. 4. Photo must show you and your “happy birthday” wish to President Barack Obama in a creative way. All decisions of the U.S. Embassy Facebook Team are final. Prizes will be sent to the winners. Limited to residents in Indonesia. Submission will be closed on midnight WIB August 4, 2009. The US Embassy Jakarta Facebook page is one of the most active US Embassy Facebook pages around. It probably is not surprising that it also has an active community of 2,983 fans. A new survey by the Pew Research Center’s Global Attitudes Project, conducted May 18 to June 16, finds signs of improvement in views of America in some predominantly Muslim countries that held overwhelmingly negative views of the United States in the Bush years. The most notable increase occurred in Indonesia, where people are well aware of Obama’s family ties to the country and where favorable ratings of the U.S. nearly doubled this year from 37% in 2008 to 63% in 2009. Read the full report including interactive graphics at pewglobal.org. […]The Department should reassess the policy of linked assignments. While it is an important incentive for some, but certainly not all, personnel in Iraq, it is the most difficult to continue to implement. As pointed out in a 2007 OIG report on human resources, it may not be sustainable. The policy has also diminished the ability of some onward assignment posts to carry out their responsibilities effectively. For example, a recent OIG inspection of Embassy London noted that by 2010 linked assignments will result in only one experienced economic officer in that Embassy’s large and busy economic section. A senior officer in Embassy Baghdad felt strongly that the linked assignment policy should be terminated, saying he preferred to have people in Iraq who chose the assignment on its merits rather than as a means to get another job. The OIG recognizes that this is a complex issue and that it requires further analysis by the Department in the context of a more general review of the incentive packages for Iraq and Afghanistan. Erik Hersman grew up in Kenya and Sudan and is, as he puts it, “one of those guys who’s much more ‘at home’ in Africa.” From his home in the US, he keeps two influential blogs: WhiteAfrican, where he writes about technology on the African continent, and AfriGadget, a group blog that celebrates African ingenuity. During the Kenyan post-election crisis of 2007-2008, Hersman helped create the website Ushahidi, a place to report incidents of violence via the web and texts. The original Ushahidi tool was written in two days; later that year, it won the NetSquared Mashup Challenge (and a nice check to help further development). Now the Ushahidi team’s next project is to build the Ushahidi Engine, a free and open-source tool for crowdsourcing information and seeing communities online. And you can help. Erik Hersman is an alumnus of the TED Fellows program, having attended TEDGlobal 2007 in Arusha, Tanzania, and TED2009 in Long Beach, California. Find out more about the TED Fellows program.